Omron 10 Series Upper Arm Blood Pressure Monitor With Bluetooth (model BP786) has all the features of the Omron 10 Series monitor - and more. Now you can access your readings anytime and any place with the new Omron Wellness mobile and website apps. Omron 10 Series Upper Arm Blood Pressure Monitor With Bluetooth (BP786) has all the features of the 10 series monitor and more! You can now access your reading anywhere and anytime with the new Omron Wellness mobile and Website apps. 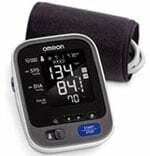 Omron is the #1 doctor and pharmacisit recommended home blood pressure monitor. Comfortable and Simple: The Omron 7 Series upper arm blood pressure monitor is comfortable and simple to adjust, the pre-formed ComFit cuff inflates around the entire arm to avoid incorrect cuff positioning to ensure a precise reading. Best of all the expandable cuff fits standard and large arms! Easy Management: Manage and track up to 120 readings on your blood pressure monitor and unlimited readings on your smartphone with Omron's free iOS and Android applications. Easy-To-Read: The screen is easy to read and features a backlight, extra large digits and multicolored indicator lights that show how your reading compares to normal home blood pressure levels. Empowered Accuracy: Feel empowered by accuracy with exclusive technology that automatically displays the average of your last 3 readings taken within the last 10 minutes. Plus it detects irregular heartbeats! Machine worked well until recently it started automatic reading of 3. Sometimes I don't have time to sit for 3 readings, but need to know my bp status. Ive tried to get it back to single reading but cant. Please help!